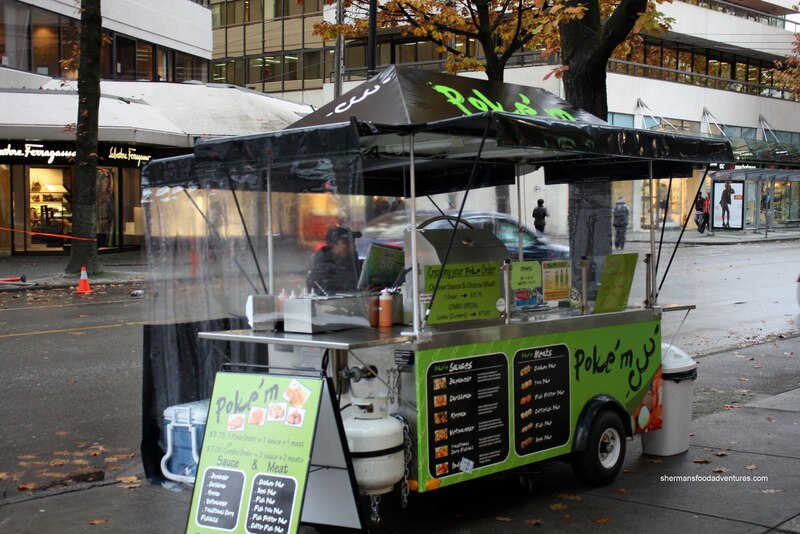 Residing at the prime corner of Robson and Hornby is Poke'm. The premise here is to pick your balls and sauce. Nothing like a choice of balls and sauce! One order of 4 costs $3.75 and the combo of 2 choices goes for $7.00. 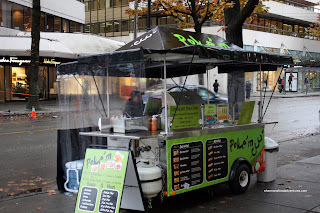 A little pricey for meatballs; but it is consistent with most of the other food carts in Downtown. Not knowing what to order, I asked for the 2 most popular balls. The first one was the Cuttlefish Balls with Japanese sauce. By looking at the picture, something is quite obvious. 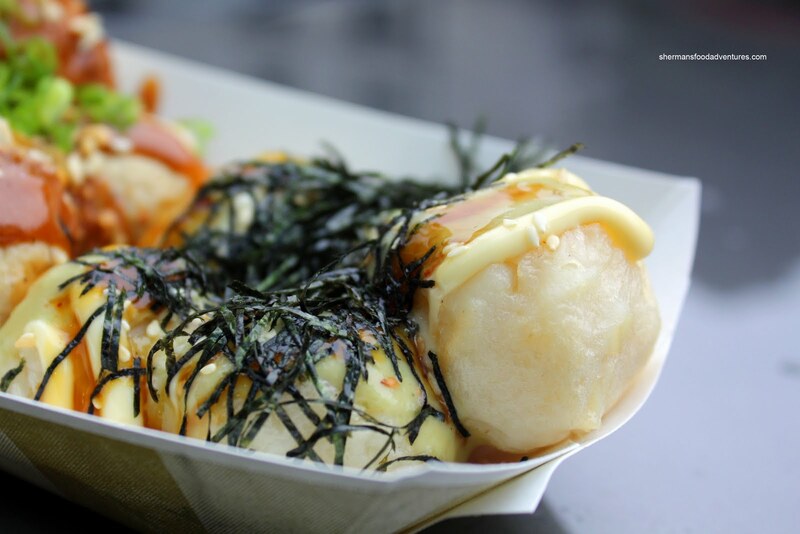 If you said that it looks like balls with Terimayo (a la Japadog), you are correct. A combination of teriyaki, mayo, sweet wasabi, nori and sesame seeds, this tasted very similar to the Terimayo. In terms of the cuttlefish balls, they were quite soft with only a slightest of chew. I personally like mine a bit chewier; yet they were still quite good. I wasn't as enthused about the Chicken Balls with Vietnamese sauce (sweet peanut, cashews, fried onions and green onions). Nothing wrong with the sauce itself, it was not bad with a definite nuttiness. However, the chicken balls were too big. I don't like big balls. Uh... Anyways, the sauce to ball ratio (man, this whole post sounds sketchy...) was not good. Furthermore, there was this strange aftertaste from the chicken ball that was not pleasing. 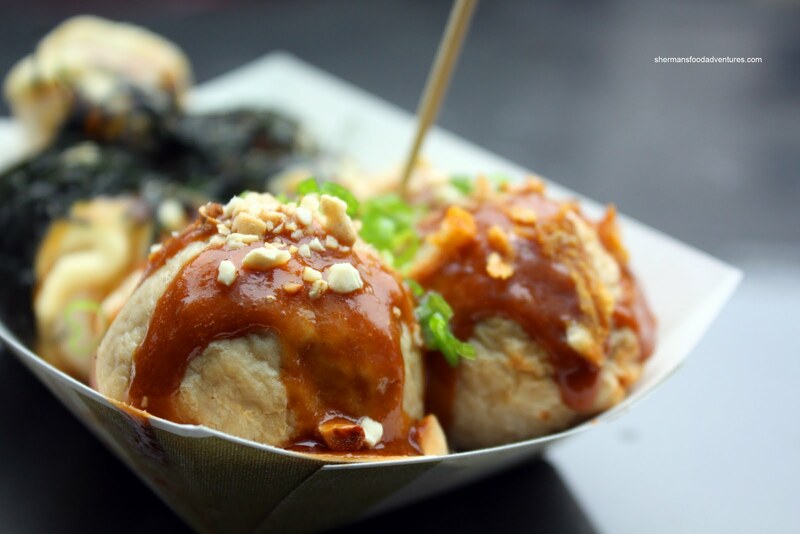 Imagine the aftertaste from a Vietnamese beef ball in the form of a chicken ball. However, this could just be a personal preference. 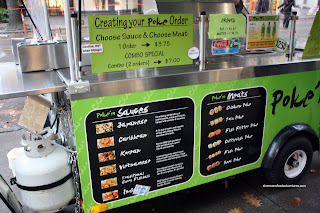 Actually, I enjoyed the snack here at Poke'm. Not bad, especially with all the possible combinations. But... once again it comes down to the pricing. Normally, curry fish balls are one of the cheapest items. I realize that there are operating costs involved and this is not exactly curry fish balls. I'm just wondering if people can look past that psychological barrier due to the image of meatballs and how much they should cost. - Despite all the positives, do people want to shell out almost $1.00 for each ball? Hahaha! "pick your balls and sauce!" Kim, we're in the business of confusing LR... LOL... Yes, same thoughts again! Stop it! Yah, I think my lighting conditions were better than yours. It's not the picture-taking skill at all! Jamie, nothing better than balls and sauce! I should check out that stand. One day Sherman, one day... you will have to change the rating of your blog to PG-13. Balls? Nuttiness? Poke'm? Ball to sauce ratio? Tell me where you are going with this? LOL. Thanks for the review again.